In lieu of the ubiquitous Best Of post, how about a mind-blurring, possibly twitch-inducing video of all my flickr pictures (made over at Pummelvision). Which, ya I get it's still a Best Of of sorts. Just a recap of the last 5 years of my life (actually now that I think about it, some of my pictures are over 10 years old, but really there are some scanned pictures of my mom's from before I was born). The first time I watched this I actually got a bit teary. In a good, I-really-like-my-life sort of way. It goes way too fast to focus on much of anything, but I think I like it like that. And each time I watch it something different catches my attention. Like in the letter from my mom, I can see the word "stubborn" very very clearly. It makes me smile. Has anyone else tried this? I'd love to see yours if you do. Update- I took the liberty of making Jenny's pictures into one of these too. Unsurprisingly there's more of me in this one. I love this but I'm sorry I can't watch all of it, because it makes me motion sick. What I did see was fun! It is time I finally post! I must admit I have been stalking your blog for quite a while now and I just adore all of your posts! 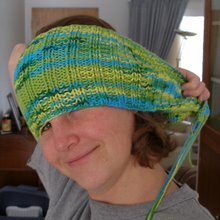 Initially I stumbled across your blog looking for patterns to make grocery bags but I just kept on reading! Here is to a new year and I cannot wait for more crafty ideas, recipes, and positivity from you for the coming year! Keep up the good work! Good Morning! I have thoroughly enjoyed reading around your site, i was linked here from a post you left on another persons page about using your christmas tree as a fire starter. i looked and looked and found no info! i was very curious about how you did this, as i would like to try it! Again i found everything on your page wonderful and look forward to reading more and sharing with my girlfriend. thank you and happy new year!